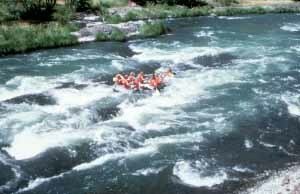 Located at the mouth of the Deschutes River, 17 miles east of The Dalles, this park provides easy access to both the Deschutes and the Columbia rivers, as well as miles of hiking and mountain bike trails. Spring wildflower displays are impressive. Facilities include 25 primitive campsites, 33 electric sites, 4 group camping areas (tent and RV), hiking and mountain bike trails, 11 miles of equestrian trails (by reservation, March 1 through June 30), and a boat ramp located at Heritage Landing day-use park across the river, as well as an Oregon Trail Historical exhibit. Campground open year-round. Max RV 50 feet.